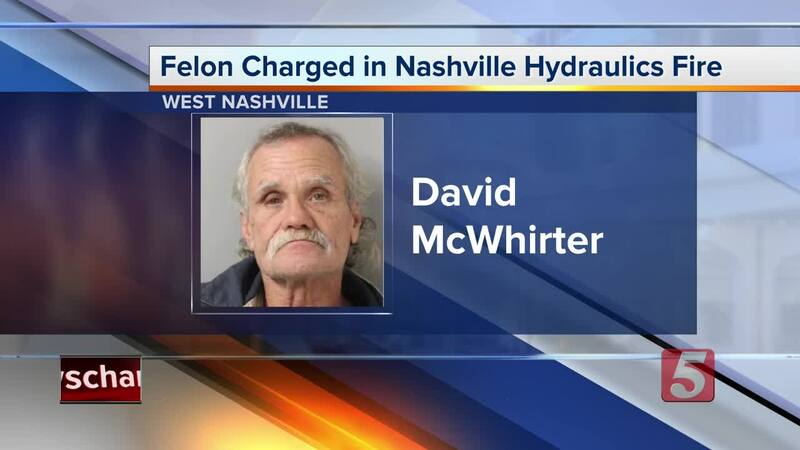 NASHVILLE, Tenn. (WTVF) — Nashville Fire Department arson investigators arrested a man they say is responsible for setting the fire that destroyed the Nashville Hydraulics building. David McWhirter, 57 was charged with arson for allegedly setting the building on the 700 block of 51st Avenue on fire on January 5. He was also charged with burglary, vandalism, setting fire to property and a felony probation violation. When firefighters got to the scene early that morning, the building was fully engulfed in flames. It was deemed a total loss worth at least $177,000 in damages. McWhirter has previous felony convictions and was also the suspect in dozens of fires. In 1999, McWhirter was charged with three arsons. He and his brother Ricky were suspects in a string of 20 arsons in West Nashville. In 2012, he was convicted after setting a fire at a house and a gas pump. He is currently being held in the Davidson County Jail without bond. He is scheduled to appear in front of Judge Aaron Holt on January 15 at 9:55 am.